Even though we are still early in the growing season and frost is still possible in Scotland in May I am pleased to have harvested my first early potatoes. These were grown in an Air-Pot potato tower which I planted up in February and kept in an unheated greenhouse. Mid May is a good couple of weeks better than last year when we harvested at the very end the month. I know a second planting is possible in these containers but I thought I would try Sweet Potato for a change, this will be a real long shot in Scotland but it would be a great way to use the potato tower; super-early potato followed by Sweet Potato through the warmest months. 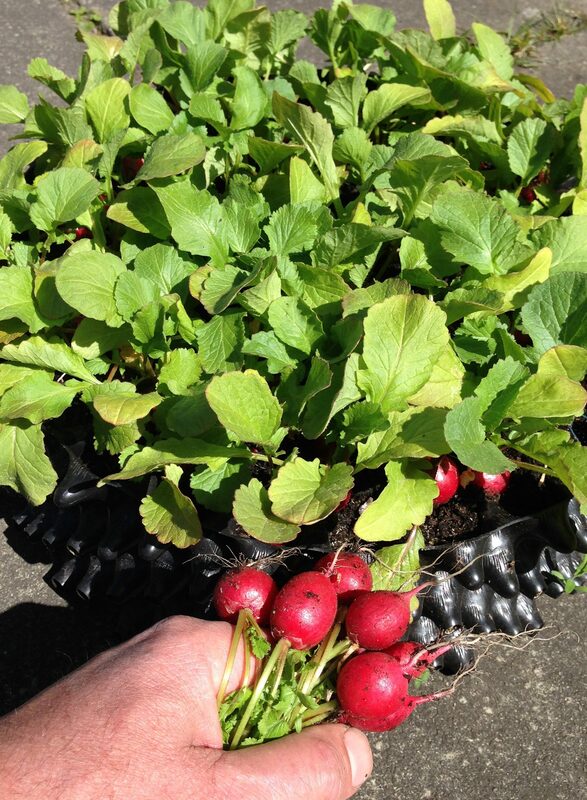 I have been getting good results using Air-Pot salad / seed trays. 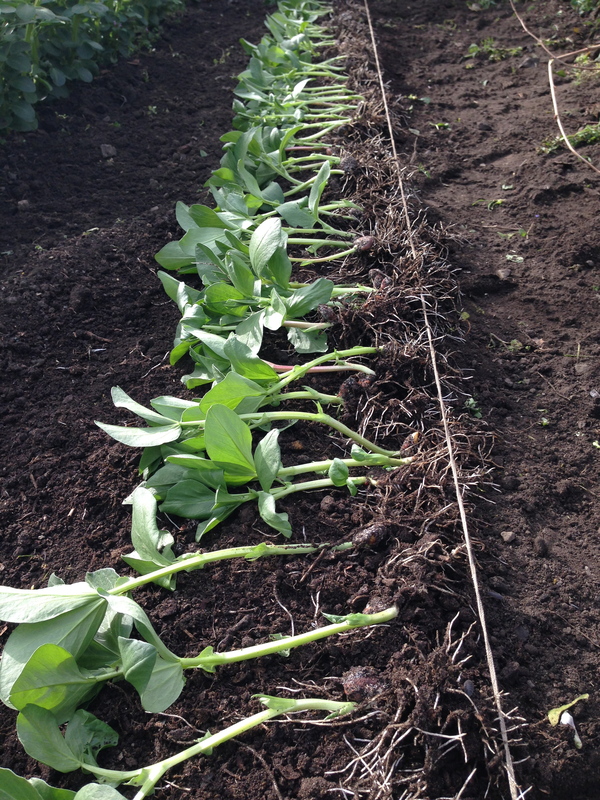 The broad beans germinated really well in an 8 litre tray, with no rotting as often occurs in the cold ground. I found the roots were easy to tease apart when the plants are about 15 cm tall and one tray gave enough plants to fill a 3 metre row with some spares. An early sowing of radish has produced absolutely perfect little radishes which are being selectively picked to leave remaining plants space to bulk up, but the early thinings are so delicious the rest will not be around for long. A lovely clean crop with no slug damage or holes in the leaves. The other pot I am using a lot at this time of year is the 1 litre propagation pot. These are currently filling up with assorted peppers, tomatoes, cucumbers and sweetcorn. 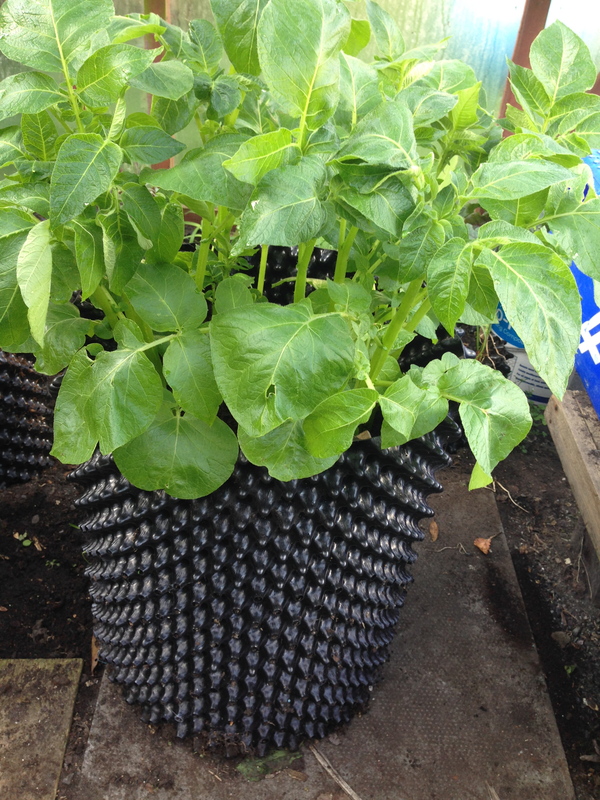 The sweet potato plants have also been kept in them and are now ready to go into to 50 litre potato tower. Quite a jump; 1 litre to 50 litre, but that is an advantage of Air-Pot containers, there is no need for small increments in pot size, the roots will fill the entire volume of compost. Early potatoes and what to pot. The worst of the winter is past, just about all the stored vegetables are eaten and there is not much to pick in the garden. This time of year used to be known as the Hungry Gap. Extra early crops are especially welcome as they shorten this gap, which is why I try to get a few potatoes ready a little earlier every year. 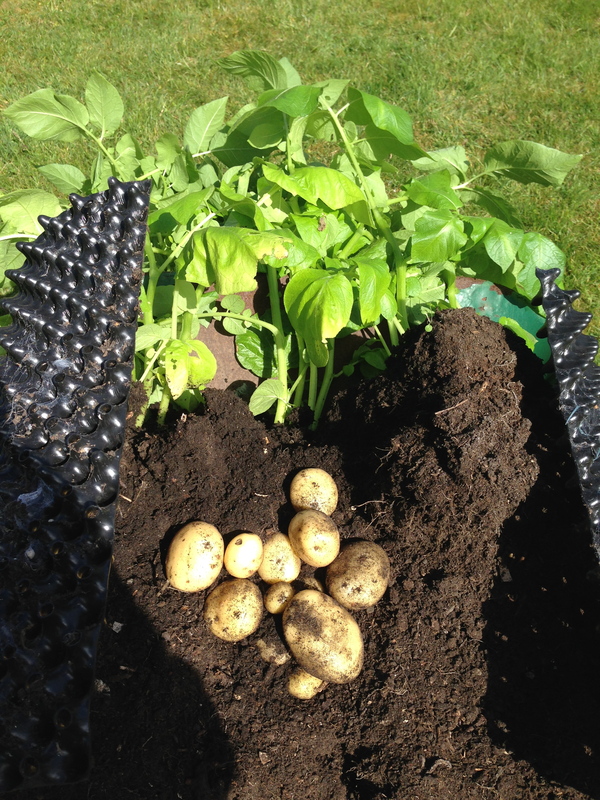 Last year we opened an Air-Pot potato tower at the end of May and got a useful crop. This year I’m hoping to have some ready even earlier. The plants are already well grown in the greenhouse and should survive as long as horticultural fleece is thrown over them on cold nights. Some ornamental perennials are coming to life including hostas in pots, I was amazed at the solid mass of roots of the old plant I saw when re-potting and dividing last year. After just one season the roots of the re-potted hostas had already completely filled the new pots and were following the pot walls in layers. So, a prime candidate to benefit from the air-pruning achieved in an Air-Pot. 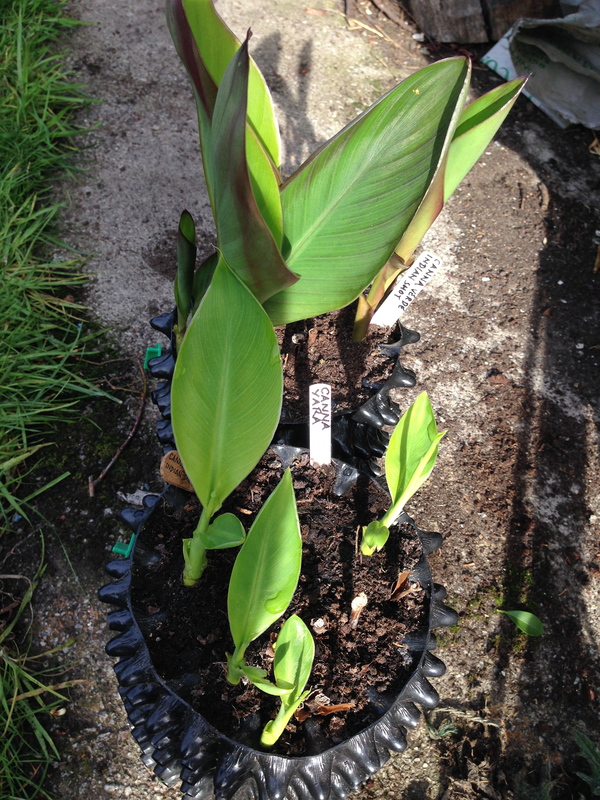 Along with other vigorous rooted plants, like agapanthus, canna and banana, I want to see if air-pruning keeps them happier for longer in a pot. 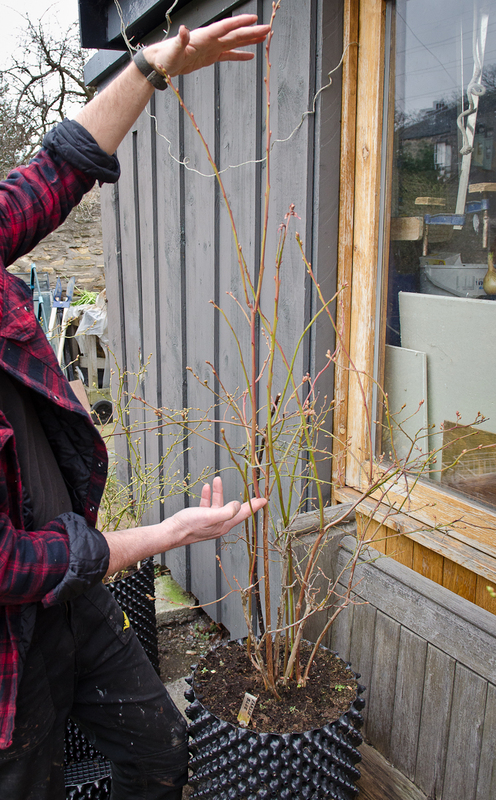 It seems logical that terminating the growth of roots by air-pruning, leading to more branched roots, is better than allowing endless circling and the roots growing layer upon layer around the side or base of a conventional pot. 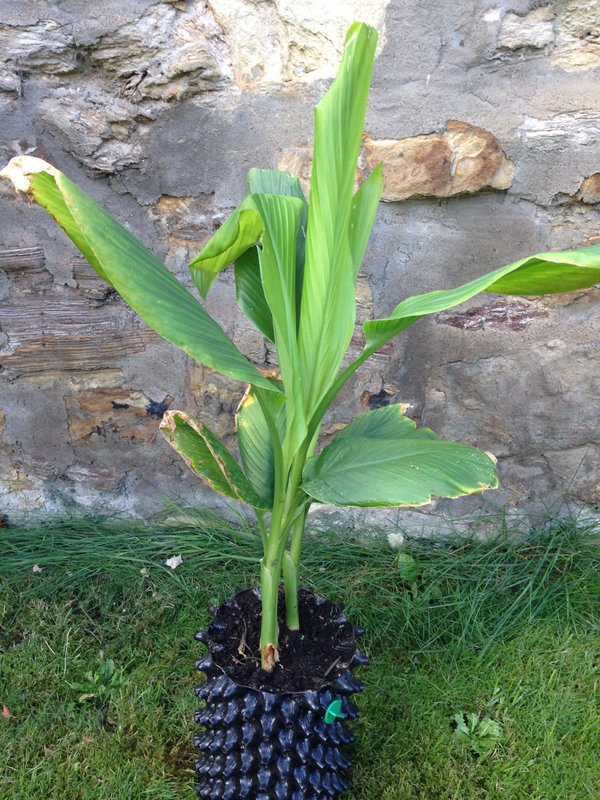 A couple of canna in little 3 litre Air-Pot did well last year and apparently these flower better when they are not over-potted, so they will stay in these for another year.Likewise the agapanthus is being contained by its Air-Pot, this had actually burst its old pot, the new leaf is looking lush. We will see how both these flower this season. 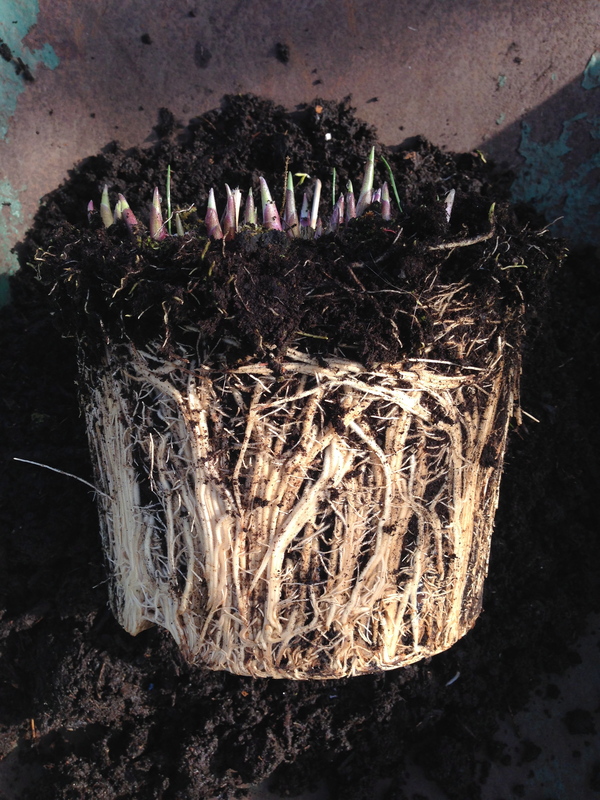 Also lush and pristine is the new growth of the chives, unlike plants which cope with constrained roots, alliums seem to respond well to rich soil and a generous root run and they like good drainage. So I’ve put a little self-seeded clump into a big Air-Pot, lovely Spring greenery close at hand by the back door and hopefully a good show of purple pom-poms this summer. It is time to think ahead to the coming growing season and I have been moving some plants on to bigger containers. The blueberry plants put on a huge amount of growth last year and when opening up containers the roots have clearly filled their old pots. Most will go on to the biggest Air-Pot containers, either Extra Large pots, or Potato Towers. With lots of ericaceous compost the plants should be happy for several years. 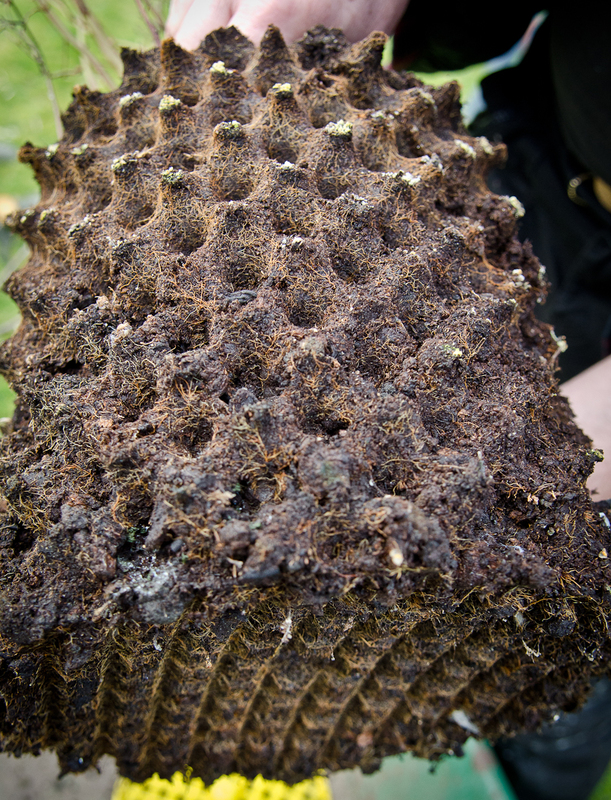 All they will need is occasional removal of a old stems and lots of ericaceous feed. Blueberries are definitely one of the most financially worthwhile crops and unless your soil is naturally acid they will always struggle in the ground. 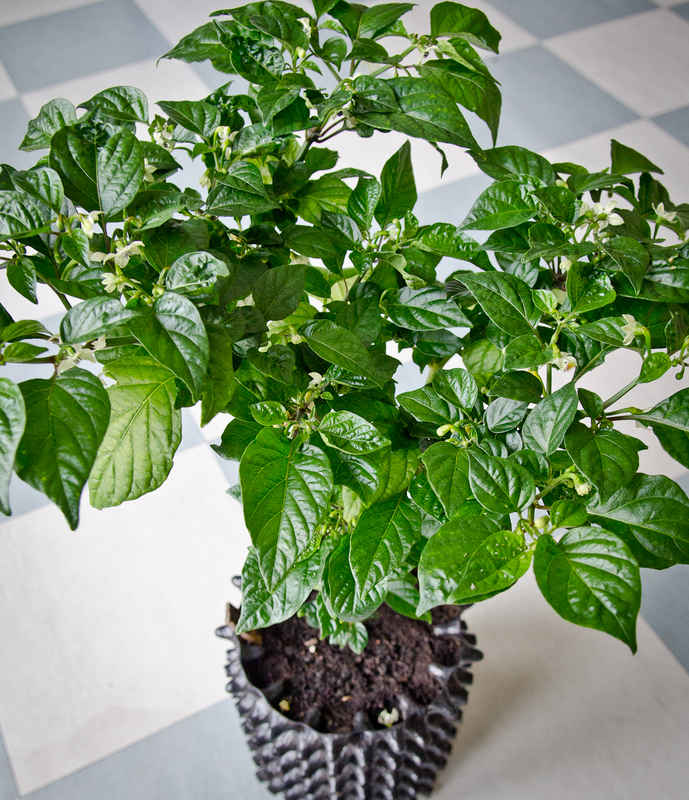 Another plant which has appreciated potting-on is a Carolina Reaper chilli which was looking a bit sickly in a 1 litre Air-Pot. Since going into a 3 litre pot just after Christmas it has put on some lovely glossy new growth and is covered in flowers. This is the hottest chilli in the world so if it crops well I’ll probably have enough heat to keep the northern hemisphere warm next winter. 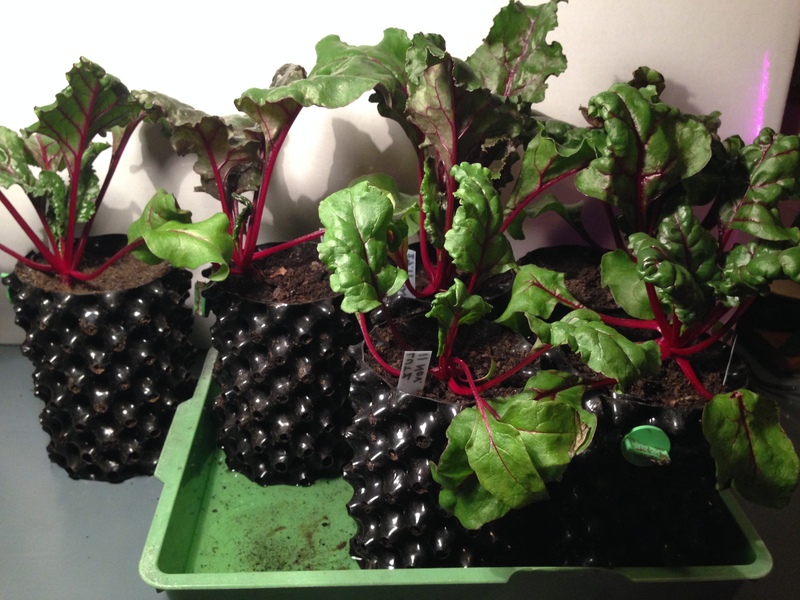 The winter beetroot experiment continues, this was just a fun winter planting to see how big a beetroot can grow in a 1 litre pot. The plants were kept in a grow tent under lights. The leaves are looking really healthy and the roots are swelling nicely, so they should yield a few super early beets soon. Other early season plantings are onions, leeks and salads in trays, and potatoes in the big 50 litre Air-Pot potato towers; these can be kept in the greenhouse with fleece over the young shoots during cold nights. My stored potatoes are nearly finished so the sooner the super-early container grown ones are ready the better. Last year we had some at the end of May, I am hoping to have some by mid-May this year. Last year I had great chilli crops in Air-Pot containers, mainly of a variety sold to me as Nigel’s Outdoors, so I was inspired to try more types. This year I have had success with Fresno, which appears to be identical to Nigel’s Outdoors. 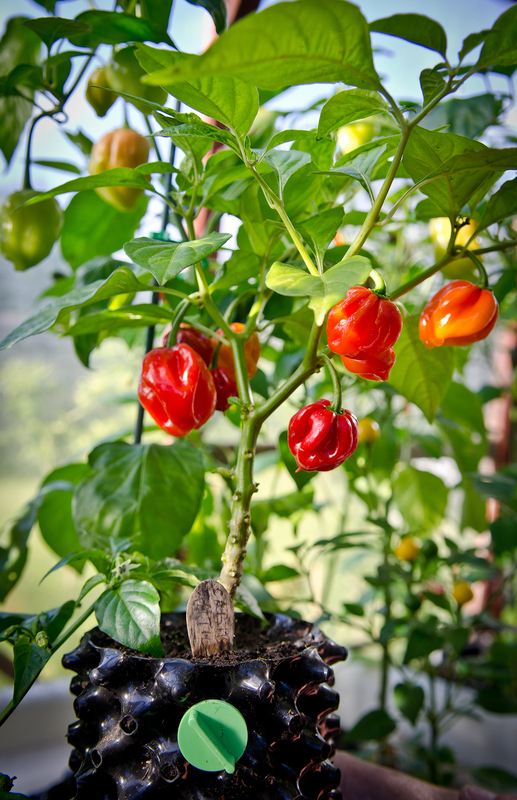 Other good performers have been Cayenne, Bulgarian Carrot and Hungarian Hot Wax, along with Aji Benito and Piri Piri, which had good early ripe pods.I was pleasantly surprised that Caribbean Antillaise and Komodo Dragon did well because these are Capsicum chinense, varieties which generally need a long hot growing season. Too many chilli plants crammed into limited greenhouse space meant many did not get potted on soon enough, but even in the 1 litre Air-Pot prop-pot I was impressed that plants grew well and fruited despite being somewhat “bonsaied”. 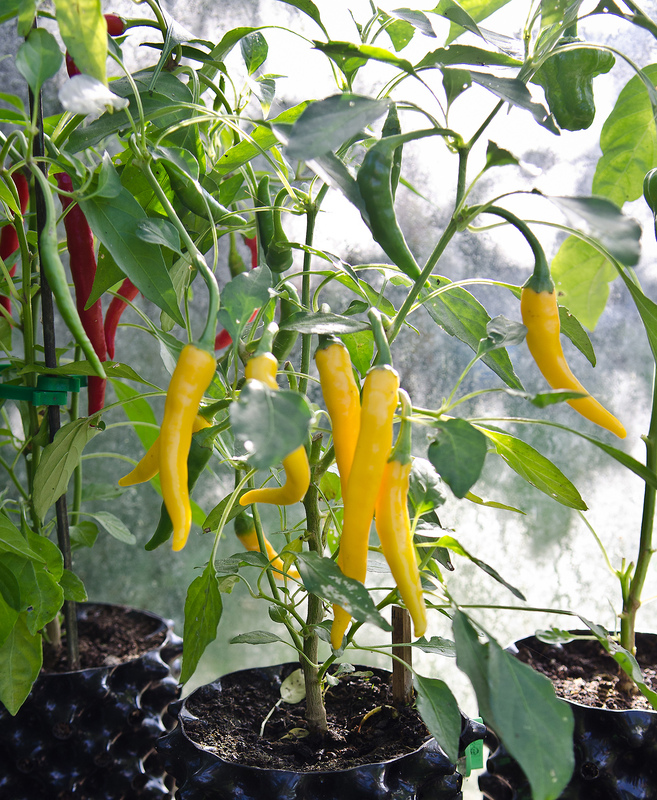 The optimum Air-Pot container for most chillies grown as annuals is the small 3 litre size, but very vigorous types and overwintered plants can benefit from a bigger pot. The cool tolerant Rocoto chillies (Capsicum pubescens) will go into the 9 litre medium pots next year if they survive the winter; apparently they can grow into quite substantial bushes over a few years. 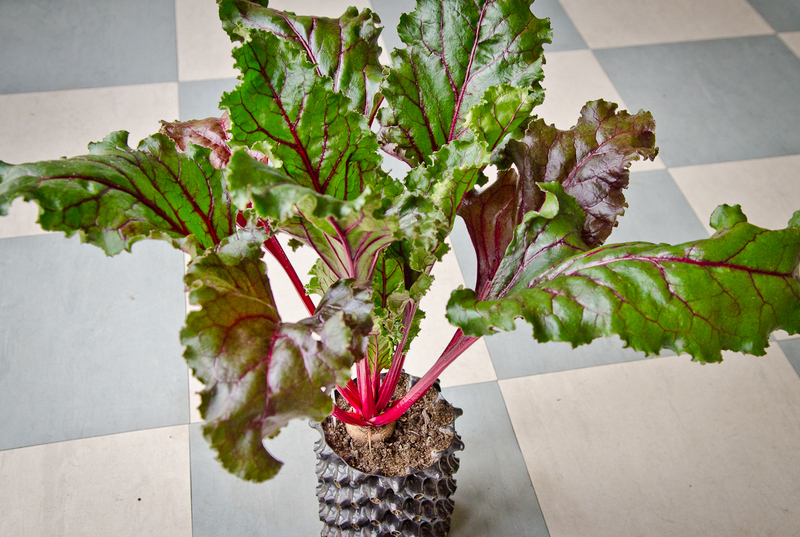 I am resolved to grow fewer plants of the best performing varieties and improve my growing methods, give them more space to flourish, pot-on sooner, and perhaps spread reflective foil on the staging, to boost light levels. However it will be hard to resist trying a few more new varieties, and my 2017 chilli list is already lengthening. 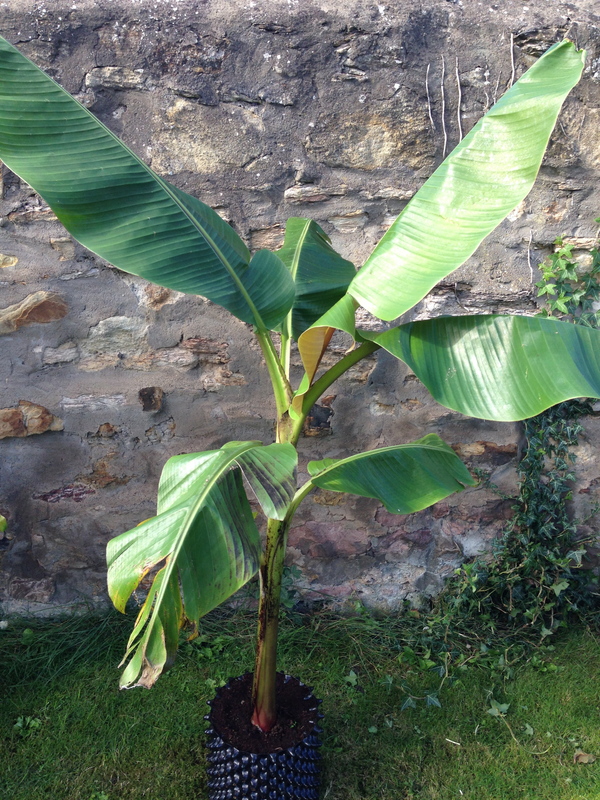 As we approach the end of the growing season, the star performer in terms of size achieved from a seed sown this Spring is a banana plant. The rate of growth has been amazing, it quickly outgrew a small propagation Air-Pot and the 3 litre size. I noticed the very vigorous fleshy roots tended to thrust out through holes in the base more than is usual with other species, they were determinedly seeking expansion room. 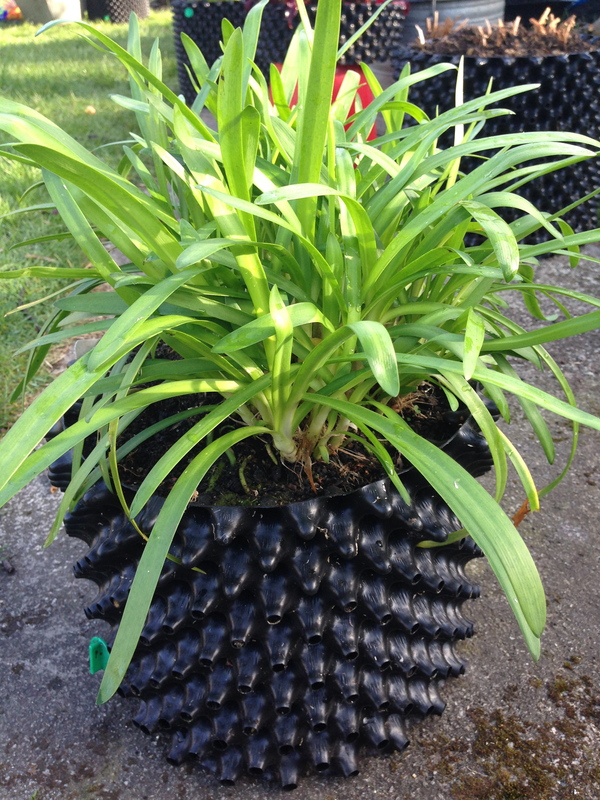 When these roots were air-pruned by the Air-Pot container the overall root development benefitted. Foolishly I left the banana on moist earth for a couple of weeks in July, allowing the roots to bridge the air space at the bottom and delve down into the greenhouse border. Luckily I was able to lift it with roots intact and coil them into a bigger pot. This was a good demonstration of how roots can grow in air if the humidity is high enough. Other very vigorous rooted plants that I will be interested to try in Air-Pot containers are Agapanthus, Canna and Hosta, these plants seem to crowd resentfully against the side of a normal plant pot forming layers of root instead of being dispersed through the entire volume of compost. 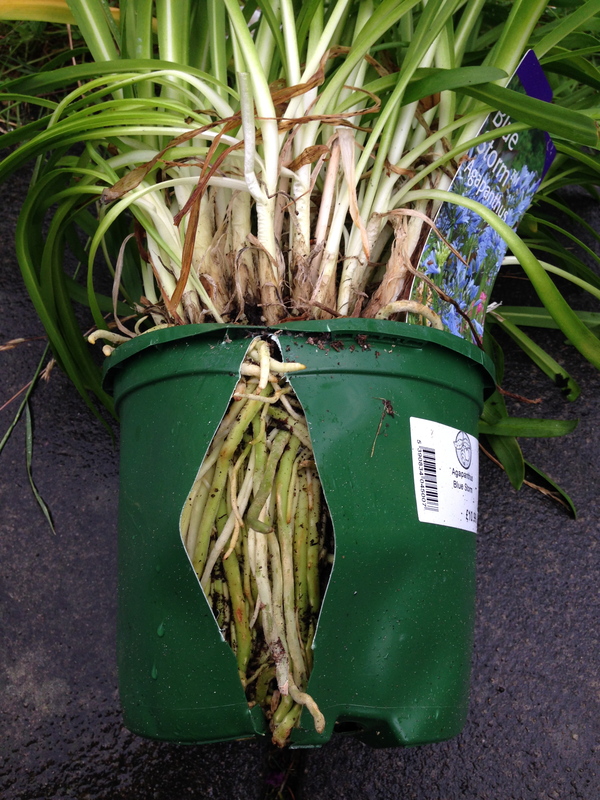 When I bought a Blue Storm Agapanthus recently the roots had actually split the pot open! 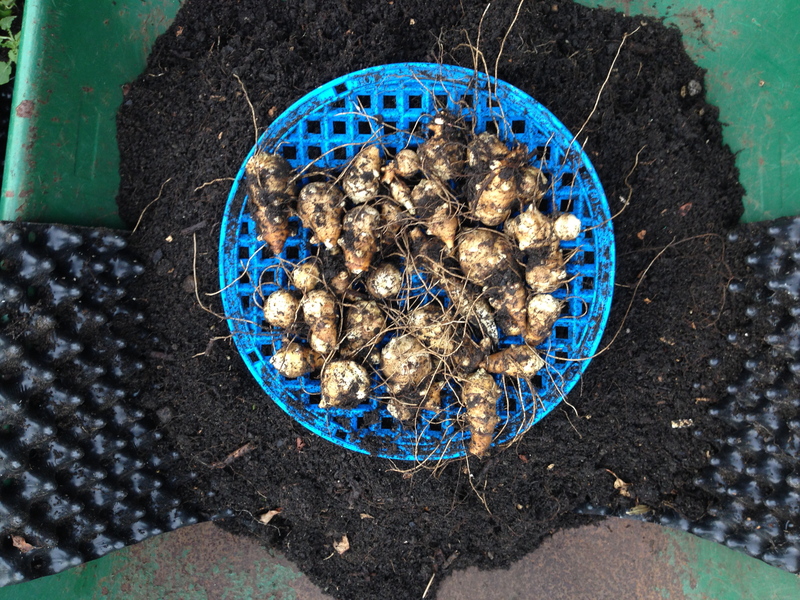 Finally, a random experiment which I look forward to unearthing is Turmeric grown from a shop bought root. 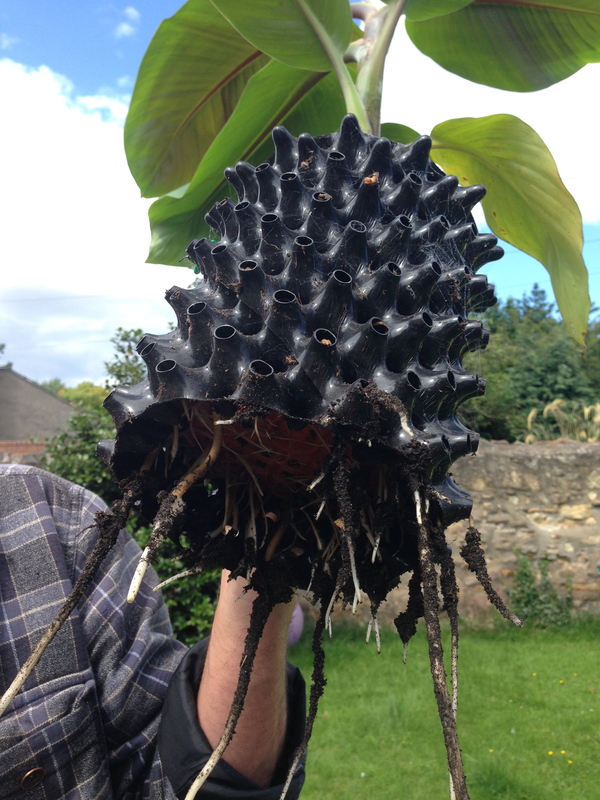 I don’t know if it is particularly vigorous rooted but looks strikingly similar to a banana and is doing well, so here is a picture. As the end of Summer approaches the tomato harvest is at its peak. All the plants have grown fantastically well in a mixture of medium and large Air-Pot containers. The super early types which do not grow very tall were in medium sized pots and produced ripe fruit from June. 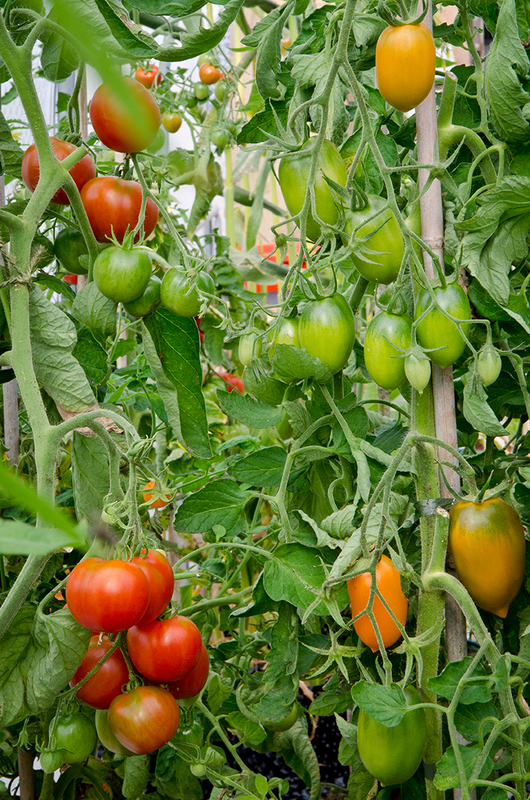 Behind the earlies are the taller, later ripening varieties which are now producing well in large pots. The only difficulty has been the plants are too big, the vine / cordon types are all trained up to the ridge of the roof suggesting a super root system has developed. I am not complaining but perhaps next year will train and prune to keep the plants lower so I don’t have to duck under them. Growing in alternative containers such as grow bags or conventional pots would have constrained the growth somewhat I’m sure. 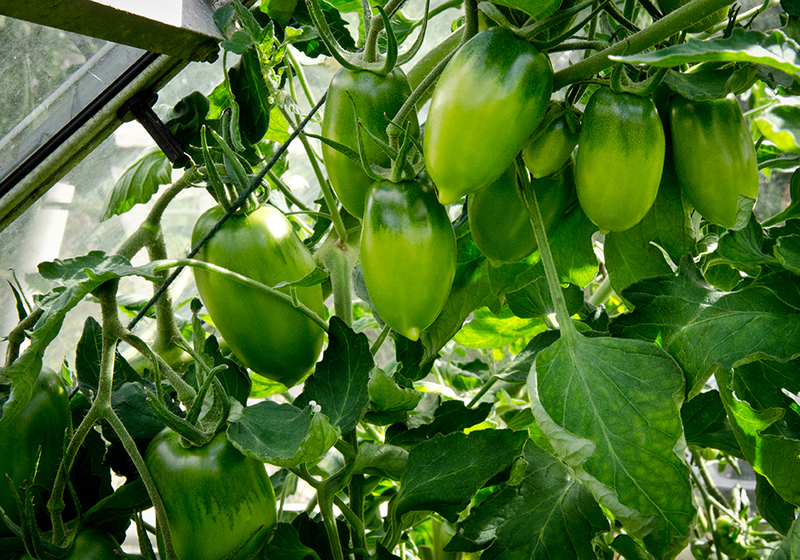 When I grew in the greenhouse border by this is the time of year my tomato plants would sicken and yellow. I am not sure what caused this; deficiency, fungus, bug or disease. But growing in pots rather than in tired old soil has cured the problem, and using Air-Pot containers together with automatic drip irrigation has worked well. 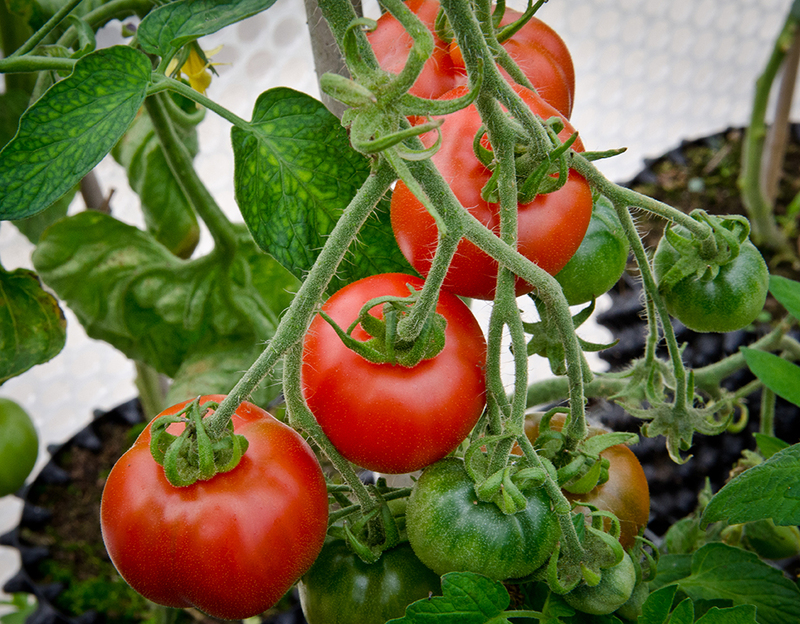 Healthier plants which grow bigger and keep cropping for longer is a good result and it will be interesting to see just how long they will keep ripening into the Autumn.